Abu Dhabi’s islands are a hub of resorts, hotels, and restaurants. Amidst these, lies a gem of culinary goodness, in Saadiyat Island at St. Regis Hotel, you have the glorious Caramel. As the name itself would imply, prepare yourself for an oozing and tantalizing assault on your taste buds when visiting Caramel. My husband and I had heard a great deal about Caramel, and so we decided to go on a road trip and embark on the drive from Dubai to Abu Dhabi. Once there, the hotel was simple to reach, and totally worth the drive—the hotel boasts of Mediterranean-style architecture; warm, neutral, inviting, and overlooking the sea. Caramel is perfectly located in the midst of the hotel at a perfect proximity for you to enjoy the salty sea air, while also plenty of parking space for the valet that will greet you at the entrance with a smile. After walking in, we were greeted by the restaurant manager and the hostess, who both warmly and enthusiastically welcomed, and seated us. At this point I was already satisfied enough to leave with a smile on my face—I was completely oblivious to the heaven (yes, heaven) that was yet to come. Upon walking in, the venue was dimly lit which enabled each and every table to enjoy a romantic candle lit dinner. The moment I walked in I realized that Caramel was most probably the ideal venue for any romantic occasion—wedding anniversaries, first dates, or just a scrumptious meal for two; on the other hand, I do not think it would be the most comfortable place to have dinner with, say…your father? Although in the beginning I felt the dim lighting made the décor less visible; I quickly realized that the dimness offered maximum intimacy, comfort, and ease as I was able to concentrate more on my meal and husband than be distracted by a neighboring table. Having said that, I must say that the bathroom was also dimly lit which proved to be quite the dilemma for a self-proclaimed klutz like myself. Once my husband and I were comfortably seated our waiter, Chameed, gave us our menus. The menu was a medium-lengthed, international-flavored, eclectic work of art that painted a masterpiece in your head as each ingredient was read. The array of choices was enough to make my head spin and so Chameed who was a wealth of knowledge to anything Caramel related, recommended starters, mains, and desserts after asking about our food preferences. He was very familiar with every nook and cranny of the menu—every ingredient, flavor, cooking method—and his recommendations did not disappoint. With Chameed’s help my husband and I were able to order a spread of both Asian and Italian flavors, our favorites. 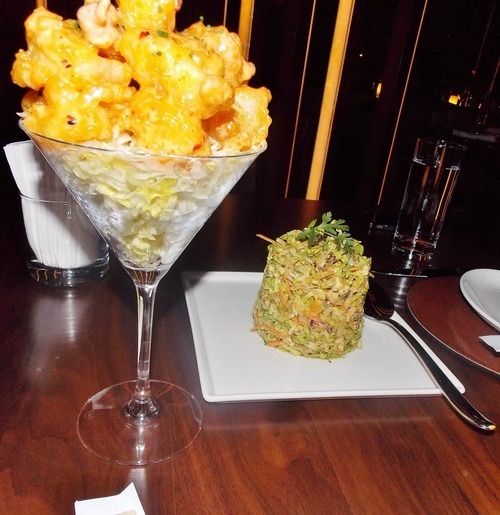 For starters we ordered TNT Shrimps and the Chinese Chicken Salad. Oh me, oh my! The TNT Shrimps arrived straight from the fryer—hot, crisp, and slathered in a Japanese mayo. The light and airy batter that coated the shrimps along with the creamy and spicy mayonnaise was the absolute perfect combination; they were exquisite. The Chinese Chicken Salad arrived in the shape of a tall tower of numerous ingredients attentively selected to balance each other. Chameed later informed me that the salad was constructed of over 15 ingredients, and the dressing alone was made up of 16 ingredients. It was a salad served cold that combined crunchy wantons, bean sprouts, and red cabbage, juicy clementines, and perfectly cooked chicken cubes to name the absolute least. This salad combined the sweet and savory, the crunchy and soft, the zing and tang—it was a Japanese geisha dancing gracefully and skillfully on my tongue. As for the main dishes: based on Chameed’s recommendations, I ordered the Seared Chilean Sea Bass. 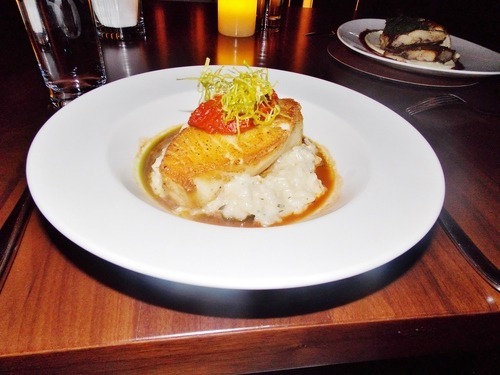 The perfectly seared sea bass with its simply seasoned crust on the outside, and flaky, moist flesh on the inside was only made even better with the creamy and gooey rock shrimp risotto underneath it. The risotto was set in the middle of a pool of rich and flavorful lobster broth, and topped with a basil and sun-dried tomato tapenade. The slight tart of the tapenade along with the meaty crunch and flake of the sea bass cut through the decadence of both the risotto and the lobster broth. Every mouthful was a festival of wonderful flavors dancing hand in hand—it was absolutely heavenly. My husband chose a lighter main course than mine, but equally as satisfying. 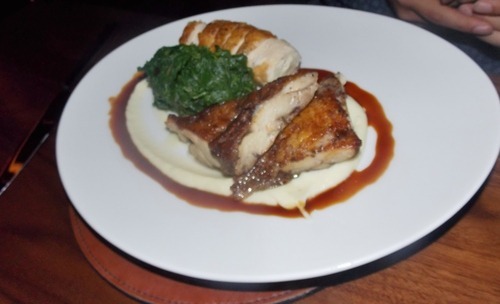 He chose the Marinated Grilled Chicken that was set on a bed of pureed parsnip and topped with a generous dollop of cooked baby spinach. The grilled chicken was deboned and cooked two ways; the thigh was grilled until the skin was caramelized and crunchy and the meat was moist and just falling apart, and the chicken breast was valentined and then wrapped in the skin and pan fried for a little extra flavor and crunch—delish! My husband devoured the dish faster than I could get two bites in, but from what I did taste, I could not yet tell which of us had made the better choice. As if these wonderful dishes were not enough of an assault on our taste buds, Chameed recommended two desserts of which we thought sharing one may be for the best. We ordered the Chocolate Chunk Brownie and it was indeed “euphoric” as their Facebook page mentions. 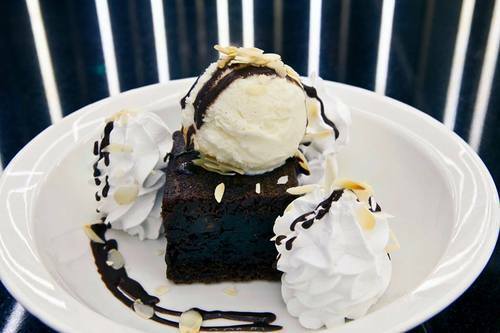 A fluffy warm brownie drenched in chocolate sauce and topped with a fresh vanilla bean scoop of ice cream just oozing off the sides! And if that wasn’t enough, two giant dollops of whipped cream on the side, and toasted almonds for extra crunch. Oh my God! It was quite honestly too delicious looking to photograph—meaning my husband and I stuffed our faces before we realized that we had forgotten to take pictures (I’ll see if I could borrow one off their page just so you could see how heavenly it looked). A waft of chocolate and freshly brewed coffee filled the room the second our dessert left the kitchen, and when it reached our table I was almost in tears. The dessert is an absolute MUST try; although, I must warn you, the portion is rather large and could quite easily be enough for two—but that depends on you and how much you could get away with opening the zipper to your pants in public. I feel like one can tell a lot about the standards at which a restaurant holds itself through the thought put into each and every element on their menu. Having said that, their coffee was the best coffee I have had in all of Dubai—NAY—ever! I would seriously consider driving an hour and a half for the coffee alone. It was the cherry on top of the delicious meal we indulged in. Go straight up bananas and give Caramel a shot!